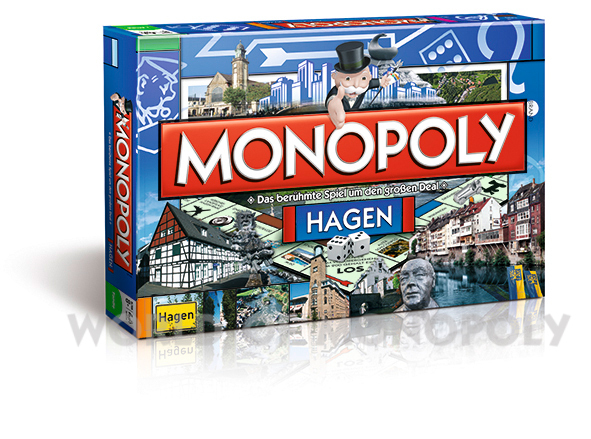 Hagen is the 39th-largest city in Germany, located in the federal state of North Rhine-Westphalia. It is located on the eastern edge of the Ruhr area, 15 km south of Dortmund, where the rivers Lenne, Volme and Ennepe meet the river Ruhr. 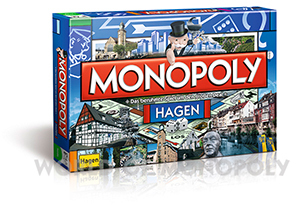 Hagen has been an important rail junction for the southeastern Ruhr valley since the first rail line opened in 1848. The shunting yard of Hagen-Vorhalle is among Germany's largest, and the central station offers connections to the ICE network of Deutsche Bahn as well as to local and S-Bahn services. 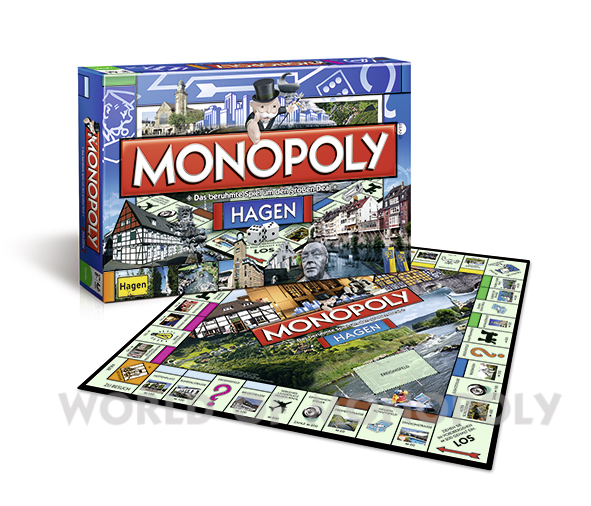 Winning Moves has released a version of the popular Hagen classic game. The most famous and beautiful streets, squares and monuments of Volmestadt are the properties. 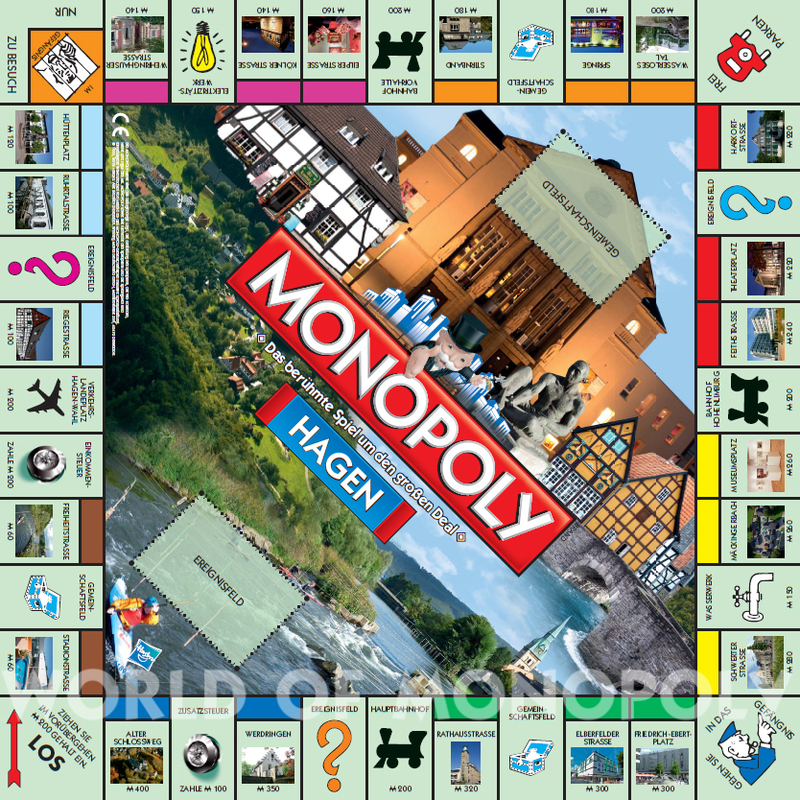 In addition, pictures of known attractions give on the court to the Hagen-Monopoly a distinctive local flavor. 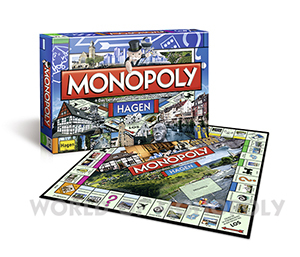 "The game combines the traditional Monopoly rules with Hagen places, it's fascinating," says Michael Kaub from the press office of the city of Hagen. With a purchase price of 400 euros in the old forms Schlossweg Hohenlimburg the equivalent of Castle Avenue, making it the most expensive street in the Hagen issue. The stadium road (original Badstraße) on Ischeland however only costs 60 euros and brings a little rent accordingly. 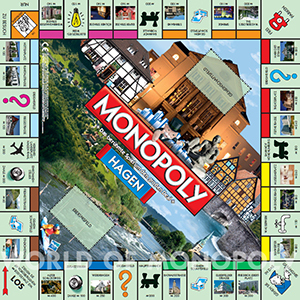 In addition to the roads and railway stations (Main Railway porch station Hohenlimburg airfield Hagen-election) and the Community Chest and Chance cards are matched to Hagen. Draw an Chance card, you can be prepared for local peculiarities that make the purse. Year: 2012 - Code: ?? ?